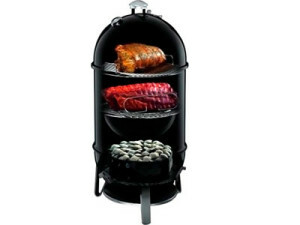 Weber Smokey Mountain is ideal for big gatherings for home cooked smoked foods. With such great design and made of durable materials, the product will last for a long time. However, a few downslides such as flaws in its design and lack of some safety features need to be considered though. Assembling the smoker is quick and easy and can be done in a few minutes. It comes with a clear guide on how to use the smoker. Excellently crafted with a big water bowl enough to tenderize the food without drying out, has a good seal on doors and joints and a temperature control. It is made from heavy gage materials and is designed to last. Moreover, it contains a big capacity for smoking for a huge number of people. Two meat products can be accommodated to smoke at the same time. The great thing about this smoker is it can be left for many hours without needing to tend to it throughout the smoking process. The door does not lock or seal tightly; allowing air to come in and smoke to go out of the smoker. Thus, keeping the temperature becomes more difficult. Furthermore, the thermometer seems to be lower than the temperature taken at the grate. The water bowl has a poor finish at the bottom and could easily be worn out. The middle part of the smoker is not equipped with handles making it unsafe to touch because of its high temperature while smoking. This makes lifting the food cylinder portion off the fire box more difficult and more susceptible to accidents. This smoker is ideal for creating food with real smokehouse flavor enough for a big number of people. It is provided with great features though there are some flaws in the design which would require the user to be more cautious in using the product to avoid accidents.